Excel Online can’t open or edit workbooks protected by a password. In fact, passwords can’t be added, changed, removed, or recovered from Excel Online. If you want to add a password to a workbook you are working on in Excel Online, and you have Excel desktop application, you can use the Open in Excel button to open the workbook and password protect the workbook. 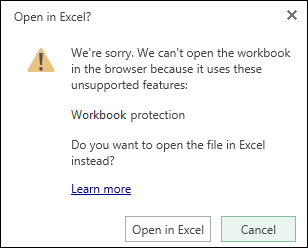 But going forward, you’ll only be able to make changes to the workbook in Excel desktop application. Click Open in Excel and password protect the workbook.